For all things water damage related, the good people of Tempe know they can turn to Chris Harper and his expert teams with 911 Restoration of East Valley to save them from the perils it can cause. Chris is always there for the residents of Tempe and the surrounding areas because he and his staff are available 24/7/365 for any kind of restoration situation that arises. In addition to this, Chris and his crew are capable of responding within 45 minutes of any call that they receive, on-site and ready to save your home or business from the deteriorating effects of water damage. “We go beyond the standard that other restoration companies stop at to give our clients a far superior experience when they are in their time of need.” Chris says. Stopping anywhere short of the best is simply not in Chris’ wheelhouse, and this is why he always makes sure to put the customer first above all else on every job. Being the solution to all of the water damage and disaster scenarios that spring up in Tempe and around the area means that Chris must be constantly vigilant and ready for everything at a moment’s notice. To do this effectively he has mobilized his entire supply of equipment and technology for just such jobs. 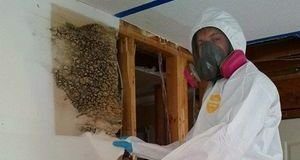 Don’t let the invasive nature of water damage Tempe issues take over your living room, bathroom or any other part of your home. Give Chris and the pros with 911 Restoration of East Valley a call today! Chris knows all too well how dry Tempe can be. But he also knows how wet it can get when the monsoons do come every year. And every year when the rain starts to pour, Chris answers tons of calls from people who are just looking for advice. While he and his staff always try and help people when they need advice after a water damage episode has occurred, they also want to give people the information they need to prevent these things from ever happening in the first place. “Preventing damage to the home when the monsoons are here can be as easy as getting the roof looked at by a professional to make sure it won’t be a source for trouble when in heavy rain.” Chris explains. Another technique that Chris advises people on is to clean out their gutters and downspouts before the rain hits so that there are no clogs that create overflows. Overflows can introduce water into the home through persistent spreading of the roof layers as they become saturated. Chris and his staff want to give every customer the best experience possible, even during monsoon season. With their experience and desire to increase customer satisfaction, 911 Restoration of East Valley will even file the insurance paperwork for home and business owners so that they don’t have to be burdened by that, and the chaos of a water damage crisis. Don’t allow your home to be a victim to monsoon season, or any other kind of water damage issue. Call Chris and the experts with 911 Restoration of East Valley today! Chris knows that Tempe’s location is perfectly situated to offer the greatest comforts to valley residents possible, but it is also in the middle of an area which receives massive rainfall during the monsoon months of the year. To prepare for this, and to prepare his clients for the water damage that might rain down upon them means giving people the advice and they need to combat the problems before they start. Monsoon season can dump huge amounts of rain on the homes and businesses of the area and in the process it can cause unparalleled levels of water damage too. “Saving homes from the water damage that results during monsoon season is a huge job,” Chris says. “That’s why all of our specialists are IICRC certified and stationed strategically around the valley to give people a quick response when they need us.” Cris explains. Rapidity is critical when water damage is washing up against the door. Lingering too long during a water damage crisis can cause more destruction and even create the strong possibility for mold growth too. If your home or storefront is already dealing with a liquid invasion, then contact our water damage Tempe team with 911 Restoration of East Valley today!